Moon in My Pocket is a ground level, open floor plan home with 3 bedrooms, 3 bathrooms and is perfect for two families vacationing together. Situated on a large bay front lot with beautiful views of Alligator Harbor from almost every room in the house. 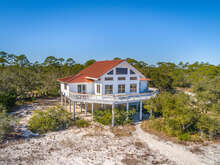 Private beach access just steps across Alligator Drive shared with 2 other rental homes including Fresh Catch. No need to walk or drive to public beach access! The beach has a covered deck for enjoying the day out of the sun and is a great place to watch the beautiful sunsets. The open floor plan offers spacious living areas that include the kitchen, dining, living room, recreation room and an extra large screened porch offering plenty of space to read, nap, play pool, cook meals together or just relax and enjoy a great day at the beach! In true beach house fashion, there are lots of windows and sliding doors, which allow the house to be opened to the bay and beach breezes. If your family likes to cook the kitchen will serve you well. The fully equipped kitchen/dining area has a professional grade gas stove with oven, two additional wall ovens, microwave and a refrigerator with filtered water and ice dispenser. For family meals together, the large dining table comfortably seats 10 with an additional extension table available for added seating. There is a large dining table on the screened porch as well, great for family meals. The living room has comfortable seating for watching TV or relaxing and opens onto the large screened porch. The screened porch overlooks Alligator Harbor, has a dining table that seats 6 to 8, multiple seating areas and a porch swing. The most unique feature of the porch is a hanging bed suspended on chains, perfect for an afternoon nap. Master bedroom with king sized bed with private bath and sliding glass doors that open to the screened porch with a view of Alligator Harbor. Second bedroom with queen sized bed adjacent to bath that can be closed off for privacy. Views of Alligator Harbor and opens to back deck. Bedroom 2 is adjacent to a 'European style' bath with components (sink/toilet/shower) aligned along a hallway just outside the bedroom door. The hallway can be closed off to the public areas of the house providing a private 'en-suite' bathroom. Third bedroom or “Dorm Room” has 2 sets of twin bunk beds, and 1 bunk with full sized bed and twin, 2 in-room sinks and a room divider that can be lowered for visual privacy. Adjacent bathroom is accessed from the bedroom and can be closed off for privacy. Great room for kids. Sunset Deck, Alligator Harbor side – second floor deck great for morning coffee, sun bathing or an afternoon cocktail while watching the sun set. If you enjoy fishing, you can fish from the beach or the bay. The covered grill area includes a sink and counter convenient for cleaning fish. Enjoy a fire outside in the fire pit from a comfortable Adirondack style chair. Payment Terms: We accept: check, VISA, MasterCard, Discover, travelers' check or money order payable to Harbor Point Vacation Rentals. There is a $20 charge for all returned checks plus the cost of collection. A deposit of 1/2 of the total rental amount (rent, taxes & fees) is due at the time a reservation request is made. Any outstanding balance of the total rental amount is due upon arrival. The Guest is responsible for all charges for damage and excessive cleaning of the unit caused by the guest. Reservation fee of $100-200 will apply. Sales tax of 9% for all rentals less than 6 months' duration.